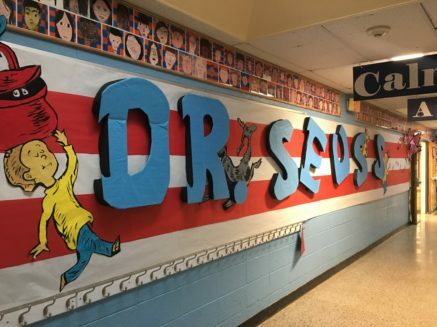 Read Across America is an annual celebration of reading that culminates on March 2, the birthday of prolific children’s book author Theodor Seuss Geisel, known and loved worldwide as Dr. Seuss. On behalf of all the students and staff at Oak Tree Elementary School, please accept our deepest appreciation for your visit on March 1. The students’ reactions were priceless and their enthusiasm was contagious. The Cat was funny, gracious, and allowed each student to either be photographed or get a high five. It was a day that will log be remembered at our school. On behalf of all the children and staff of School #17, I would like to thank NJEA and the Cat in the Hat for bringing so many smiles and joy to everyone at our school. For us, the Cat in the Hat’s visit spearheaded a series of days of reading and games which we hope will instill a love for books and reading. Thanks, again, for having The Cat in the Hat visit our school yesterday. She was a big hit with our kids (and teachers). Forest Avenue School in Verona coordinated our Cat in the Hat visit with a Pajama for Progeria Day to raise money for Team Zoey and the Progeria Research Foundation. Zoey is a second grader at our school. The entire school, K-4, met in an assembly to read Dr. Seuss stories together in our pajamas and we had a surprise visit from The Cat in the Hat. Thank you to the NJEA and to The Cat. Tara Toohey, Catherine Dwyer Elementary School, Rockaway Township. Thank – you for sending The Cat in the Hat to our school. He was a big hit with all of the students and teachers! Thank you for sending The Cat to our school…he participated in a Jeopardy game while the kids answered questions from different Dr. Seuss books. It was a GREAT day! Not an issue. Just a huge thank you for sending us the most incredible Cat in the Hat today, Eileen Pichinson. My students and all of our teachers were blown away with how amazing she was and in that incredibly tall costume. Thank you a million times! 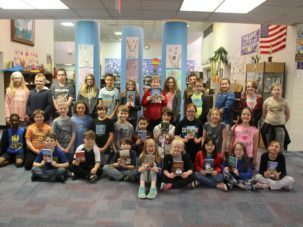 From the bottom of my heart, THANK YOU SO,SO,SO, MUCH for being such a PURRRFECT visitor on Thursday, Feb. 22 to Lincoln School in Westfield! 🙂 All of the Thing 1’s and Thing 2’s LOVED your very memorable visit and were SO EXCITED to sing Green Eggs and Ham for you! The photo opportunity that you provided was GREAT! I sent the photos to all of the teachers and they forwarded them to all of the families! I am sending you a few of my favorites! 🙂 And thank you for the book, One Fish, Two Fish, Red Fish, Blue Fish – I am planning to share your very generous gift with all of my library classes this week. Allison Turon, John Adams Elementary School, North Brunswick Twp. Thank you for volunteering your time to come to John Adams today as The Cat in the Hat. The students, staff and administration appreciate you and the time you set aside to help us kick off Read Across America in our school. Assemblies, like the one today, continue to encourage our youngest learners and instill in them a love of reading. 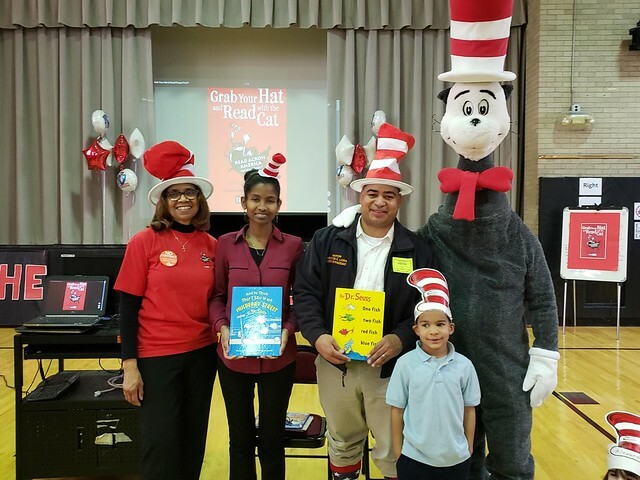 Pine Grove Manor bilingual elementary school in Somerset hosted the Cat in the Hat for the second year and it was a great experience! Students, teachers, staff and parents got together to welcome our special guest! On behalf of the Cat in the Hat, NJEA will post photos of your Read Across America celebration in a gallery. 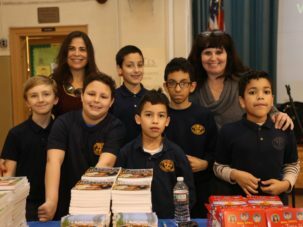 Some of those photos will be published in the April edition of the NJEA Review.